Our precious River, when he was 3 days old. Our first born son, River, was born April 30, 2009 and passed away May 6, 2009. He is one of the greatest gifts we could have ever been given. The pregnancy was completely normal, despite the fact that I fractured a bone in my foot and was on ordered bed rest for 3 months so it could heal. This was to avoid surgery during pregnancy or after he was born. I began having contractions 3 days before our due date, with active labor beginning the next day. It was fairly normal, except I was dilated to almost 8 and my water hadn’t broken yet, so the doctor asked if I wanted to wait and let it break on its own or if I wanted her to break it. As there was no concern for River’s health, she said it was up to me. The pressure was becoming unbearable and I told her to break it. After an hour and a half of pushing, River was born, with the umbilical cord around his neck twice. The Dr unwrapped the cord very fast, but he was not responsive. His Apgar score was very low (at this point I don’t even remember what it was), I just remember thinking that he had to be OK. Ben cut the cord quickly and the doctor and nurse whisked him off to get him breathing again. It felt like eternity, but we were so relieved when we finally heard him cry! The next day he began to develop jaundice so we were in the hospital until day three, then were home with the “bili-blanket” (aka glow lights) until day five with everything going normal. We had his one week check up on day five and our Dr said everything was perfect. 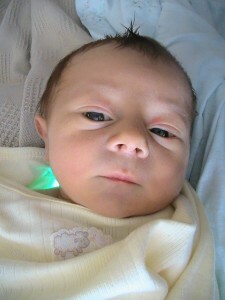 The jaundice had lowered to a safe level and he was gaining weight. On day six we woke up to find his color off. Ben immediately grabbed him and tried to wake him, then we started, then I continued CPR with 911 on the phone. The EMTs arrived within minutes and took him by ambulance to the ER. When we arrived at the hospital, they told us he didn’t make it. I, looking back, already knew he was gone before they even left our house, I could feel it. Although the entire way to there I prayed that I was wrong. The ER doctor as well as the medical examiner told us it was most likely SIDS as they could see no other apparent reason. We didn’t know that it was SIDS for sure until our autopsy came back which wasn’t for five weeks I think, I really can’t even remember. When the medical examiner called, they said “we looked and looked to try and find a reason, but as you know there was no disease or trauma.” What??? SIDS is what they classify a baby’s death as when they can find no other cause. It is the reason, when there isn’t one. River has a baby brother, Asher, who was born in March of 2010 and we are teaching him about his big brother. River was here for such a short time but has impacted us tremendously. He will be carried with us every moment of every day.